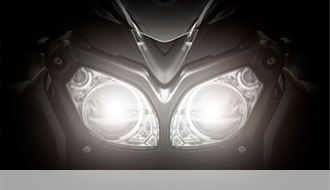 Adaptive Headlight for Motorcycles - QED S.A.
During night time the risk for a motorbike accident increases by a factor of two to three. Major causes of accidents are bad road conditions or unexpected obstacles. In order to increase safety, Quality Electronics Design has developed an efficient and effective control system for a fast and continuously working adaptive headlight for motorbikes, scooters and bicycles. The control system compensates the speed, bank angle and curve radius automatically. Peugeot Scooters in Mandeure, France, has sponsored the development of the adaptive headlight prototype that has been mounted on a "Geopolis" type scooter. The prototype includes hardware and software components as well as the headlight itself (patent pending). The adaptive headlight offers an astonishing comfort when driving through curves. Its accuracy leads to a very efficient illumination level at any speed and curve radius. The goal has been to offer an affordable, price competitive adaptive headlight to people being reliant on their two-wheeler in everyday life, e. g. people getting to work at any weather and light conditions. The adaptive headlight increases safety significantly, offering a very intuitive and natural usage. The driver does not need any adjustment period; the light beam is available right away where he or she needs it most. A short demonstration video shows the reaction speed, smoothness and precision of the adaptive light on a bicycle.